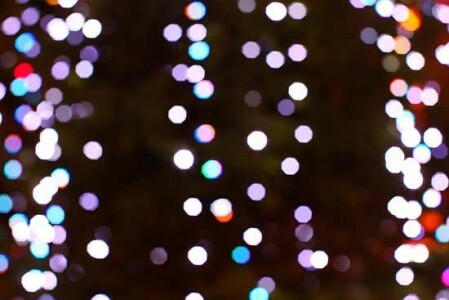 The soft and homely blur caused by lights being out of focus is called bokeh. It is one of the many ways your shot can show something completely different to the actual scene. The famous saying goes, “The camera never lies”. In fact every photo is a type of lie. The content of the shot is a pretty good representation of the scene. Is the final photograph really as would be seen by the eye? No, the camera lies. Let’s look at the facts. Everything we see is light that has bounced off something. Once light passes into the eye it is focused on the retina. The retina signals the brain which builds a picture up. The brain interprets the scene. The camera works the same way. Reflected light passes through the various lenses in the camera and hits the sensor. The sensor is stimulated to send signals to the processing chip. The chip compiles a picture of the intensity of the various signals. It outputs the result in a file that our computers use to construct a picture. During this process in the eye, and the camera, there are a number of intervention points. These are where the scene is changed. This is where the camera lies. 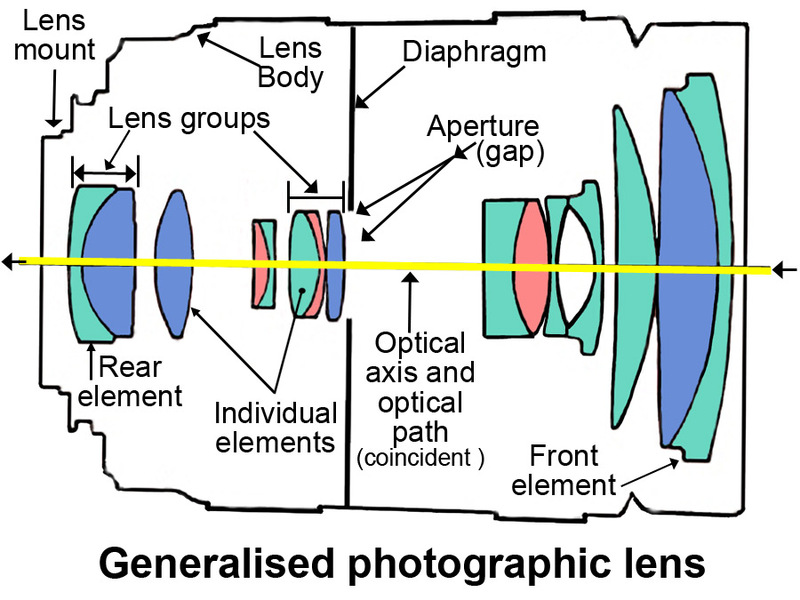 Modern ‘lenses’ are actually many individual lens elements working together. Any individual glass lens suffers from a number of failings normally referred to as aberrations. To correct these aberrations takes more lenses. One popular lens, the Canon EF 70-200mm f2.8 L IS II USM Lens is made up of 19 groups of lenses! This superb lens is probably one of the most popular Canon ‘L’ lenses. The excellent sharpness and low distortion produces wonderfully faithful representations of the scene. However, no matter how good a lens, there are shape distortions, colour (chromatic) aberrations and distortions of the symmetry of the lens. Without getting too technical about it lenses distort reality. What is in front of the lens is changed by the time the light reaches the sensor. Slightly less light, slightly changed shape, slightly different colour… a different scene. 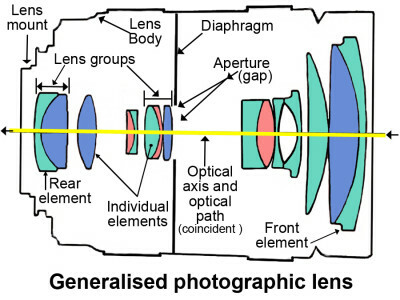 Generalised photographic lens layout showing the principle features. Lenses change the scene the eye sees. The camera lies. What you see is not what you get in the final picture. On your whim, or control, you set your camera to a fine balance of shutter speed, sensor sensitivity and aperture. There are millions of ways to capture a scene. Under or over expose, blur, bokeh, filter… all can radically or minutely change the way the camera records the light falling on the sensor. That is not the end of it. The code that runs in the cameras chips and the conversion to an image is another point of change. The ‘RAW’ image, the native data format of your manufacturer, is pretty much as you would get the data direct from the sensor. Change that file format to .JPG format and you have a translation from one type of data to another. You may change the RAW file in post processing. If you don’t make the change the camera does. The result either way is clear. There is a difference in the resultant file from input to output. The camera lies through its lens and the computing it does. The next point of change is in your computer. The computer puts the files onto the screen. The screen renders the file as instructed by the computer. However, every screen has its own interpreter. This makes the rendering dependent on the screen makers electronics, code and colour maps for the screen. This is yet another point of change. That is not all. Printing, file editing and even transmission over the Internet can all take their toll on your files. Each process changes the current file state and produces something different. After a while the file that you finally end up with is somewhat changed. It is not as it was seen in front of the camera when the image was made. Maybe you don’t see a great difference. Once your eye learns to spot the changes they are in plain sight. What we see in the final print, screen rendering or projection is different to the original scene. However, it is the fun and craft of photography to make that new view what you want it to be. This is not new or exclusive to modern digital photography. Every camera and photo-process changes the original scene. When you make a photograph it is made by the manipulation at all those intervention points. Photography is about making a new synthesis from light collected when the shot was taken. Get to know your camera and all its controls. You will be able to make your picture what you want. Remember, the camera lies. The master photographer is a master of change – not of capture. This entry was posted in Background Info., Opinion, Starters School and tagged How it works, Technology, Workflow. Bookmark the permalink.